If you have a layover of about 7 hours in Beijing then you should make use of that time and book a layover tour to see the world's greatest attraction – the Great Wall of China. The Great Wall of China can be accessed from several points along its length where it has been made possible to climb up to the top of the Wall. Layover tours from Beijing Capital Airport to the Great Wall visit the Mutianyu section of the Wall which is not only one of the best places to visit along the Wall it is also the closest section of the Wall to the Beijing Airport. Mutianyu has been faithfully restores and there are easy walking conditions and fewer crowds than other parts of the Wall. 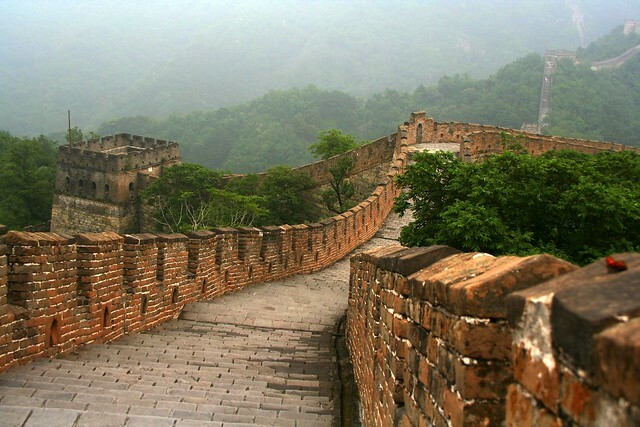 The Mutianyu section is 2.2km long and has 23 guard towers evenly spaced along the top of the Wall. The Mutianyu section of the Wall has a large parking lot not far from the Wall where cars and tour buses park. If it is possible your tour guide will take you as close as possible to the Wall otherwise you will park in the car park and take the shuttle bus up to the entrance of the Mutianyu section. There are two ways to reach the top of the Mutianyu section of the Great Wall. The easiest and fastest (and the way usually chosen by those on a layover tour) is by cable car. There are efficient cable cars which run up to the top of the Wall. Others choose to take a chair lift up to the top of the Wall. Walking along the top of the Wall you will experience steep steps, slopes and straighter sections. You can enter the guard towers and even leave your mark on the wall as new graffiti boards have now been added for visitors. Although most of the Wall has been fully restored you can see sections which have been left untouched like that near Tower 1. Looking down from the Wall there are hills covered with trees and at several places along the Wall plants and shrubs have overgrown the Wall. Before arriving in Beijing you can talk to your tour guide and decide how long you want to spend at the Wall and what you would like to see depending on how much time you have. To come down the Wall you could take the cable car, the chair lift or if you have time and are in good physical condition take an incredible 1580 meter toboggan ride all the way down! There are certain restrictions for those wanting to use the toboggan ride. If you are on a layover tour the best option is the easier and faster cable car. If you are elderly, sick, pregnant or a child under 10 years old or 130cm you cannot take the toboggan ride. At the end of your visit you can descend to the base of the Wall where there are rest rooms and several stalls selling souvenirs. Your driver will take you swiftly back to the airport at the end of your trip to the Mutianyu Section of the Great Wall.